Every once in a while, a car enters the spotlight and becomes an instant classic. Years down the road, these cars demand hefty prices when sold at auction. This is the most expensive classic cars in the world. If you thought the Bugatti Type 57S above was expensive, then check out this piece of phenomenal piece of Bugatti history. 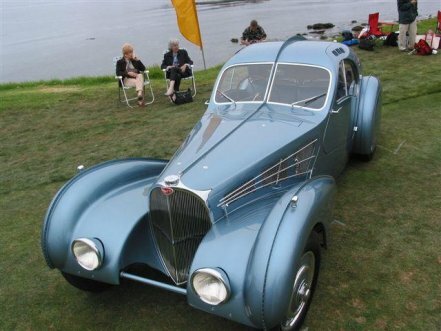 The Bugatti Type 57SC Atlantic was based on the “Aérolithe” concept car. The Aérolithe’s Electron and Duralumin construction required external riveting, resulting in a distinctive seam not unlike a dorsal fin. Despite the Atlantic’s aluminum construction, which required no such riveting, the seam was retained. Only four Type 57SC Atlantics were produced and only two have survived to this day. Fashion guru Ralph Lauren owns one while the other was owned by late Bugatti collector Dr. Peter Williamson. The Williamson Bugatti, chassis #57374, was the first Atlantic off the production line and was originally owned by Lord Victor Rothschild. While it was drastically modified by its second owner, Dr. Williamson restored it to its original specifications after acquiring it for $59,000 in 1971. After Williamson’s passing, it was sold to an undisclosed buyer, reportedly for a sum between $30 and $40 million.